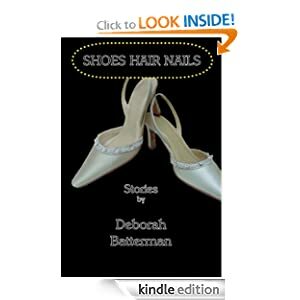 Our interview today is with Deborah Batterman the author of Shoes Hair Nails ($2.99) which has a 4.5 stars rating on 13 reviews. Before we get to the interview, here is a brief description of Shoes Hair Nails: The settings of these stories – 1980s New York City, 1950s Brooklyn, Las Vegas, an exurban town post-9/11 – are as diverse as the rich palette of characters drawn with heart, humor, and sensuality. With a sharp sense of the telling detail, Deborah Batterman weaves narratives around the everyday symbols in our world and their resonance in our lives. Do you think there’s a resurgence of interest in short stories? I love short stories, and my bookshelves are filled with collections by other writers – which suggests, to me, that there’s never been a time when short stories weren’t alive and well. That’s not to say there isn’t a cyclical aspect to their popularity – from a market point of a view. Certainly, the proliferation of online journals – and the more limited attention span we have for reading on the Internet – is a factor in their popularity. We even have Kindle singles now. Are you more of a ‘plotter’ or a ‘pantser’ in your approach to writing? Often it’s an image that gives rise to a story, which I suppose makes my approach more of the ‘seat-the-pants’ variety. The genesis of “Shoes,” for example, was seeing pairs of shoes lined up on the floor of parents’ bedroom, each with its own story, collectively a narrative about a relationship. Another story in my collection, “Hair,” began with a line – “The last time I saw my mother I was propped on a phone book in a red leather chair at Jeanie’s Hair Salon.” I let the image linger, see where it takes me, at least as a kind of jump-start to a story but the discoveries and detours along the way are what shape it and bring it to a hopefully satisfying denouement. Of course, that’s when the plotter kicks in and helps me see what shape best suits the story. Sometimes a story demands to be told from a single voice; other times, a dual-voice perspective is needed. Is there a message in your collection that you want readers to grasp? The collection is deliberately framed around symbols in our everyday world and their resonance in our lives. The title stories, for example, might, at first glance, conjure images of frivolousness and vanity. And, yet, by putting them center stage, at the heart of the collection, I’m asking readers to leave aside presumptions, step into narratives built around those very images, see them in a different light – one that gets beneath the surface and reveals the underlying metaphors. I don’t think a writer can help basing characters, to some degree, on people we know, even if it’s simply a particular aspect of someone. The skill, though, is letting that character take on a more imagined form. “Crazy Charlotte,” a title that’s as much an image as an ironic reference, is a composite character, though I do picture a woman from my childhood who was a bit offbeat, maybe troubled. With regard to events, I’m forever fascinated with how everyday events, and the ones that become part of our collective consciousness in a profound way, can be a kind of frame or backdrop to fiction. The first story in my collection, “Shoes,” is autobiography only to the extent that, yes, the narrator finds herself back home when her mother is ailing, but the turn of events is completely fiction. And the last story, “Twin Tales,” is drawn from the events of 9/11. Is a writer ever ‘not’ writing – in the sense that something is so often brewing? Then again, it’s those moments of not actively putting words down when ideas will come. I’ll be reading a passage from a wonderful novel that fuels me, or I’ll be listening to a song that strikes something up. So, to answer that question with a little less dodging: I do yoga regularly, I make playlists to listen to when I’m on the Elliptical Machine at the gym, I take long walks, I read. And I love going to the movies with my husband and/or friends. I recently finished a novel, and I’m also looking into compiling a collection of stories written after I published SHOES HAIR NAILS. bio: Deborah Batterman is the author of Shoes Hair Nails (Uccelli Press, 2006; digital edition, 2010). A story from her debut collection was nominated for the Pushcart Prize. Her stories have appeared in anthologies as well as various print and online journals. Over the years she has worked in both magazine and book editing/writing/production. As a member of the Westchester Arts Council’s Artist Roster and the Silvermine Guild Arts Center, she has conducted writing workshops, often in collaboration with visual artists. She recently completed a novel. Does A Great Book Always Need A Happy Ending?